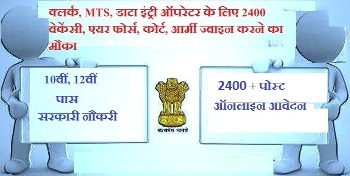 Candidates who wish to acquire government jobs in any association can now apply for 2400+ Group C & Group D job positions available under various organizations. Job notifications are issued to fill up posts of Clerks, Multi Tasking Staffs, Data Entry Operator, Lower Division Clerk and others. Various reputed organizations – Indian Air Force, Rajasthan High Court, Army Public School, Ministry of Defence and some others have issued notifications to fill up Group C & D positions. Rajasthan High Court is all set to hire 1726 LDC posts. Huge vacancy will lapse on 18 March 2017. Candidates should serve the minimum qualification level before applying. Similarly, Sainik School, Balachadi, Dubrajpur Municipality, TIFR, Army Public School and others are also hiring Lower Division Clerk and some other jobs. Candidates should check the last date of each notification before applying. Many organizations are up with Multi Tasking Staff jobs even. Indian Air Force, Zakir Husain Delhi College, Ministry of Defence are some of the important organizations to fill up MTS posts along with some other job positions. Other jobs include Data Entry Operator, Safaiwala, Store Superintendent etc. Every job listed below demands Class 10/12 pass as minimum qualification. Job seeking candidates should check the eligibility criteria for all the job posts before applying for any. Eligibility criteria also includes age limit, which should also be checked before applying. Take a look at the links pasted below and apply before the closing date.